Главная \ How it all began \ 1989 \ aka "Bal"
Candidate to Master of Sport of Soviet Union, who directly (bypassing the rank Master of Sport) have got the title: ZMS (Honored Master of Sport) - 08.06.1982 (№ 2828), MSMK (international Master of Sport) - 31.12.1982 (№ 7937). Vladimir Balyberdin is a climber hardly known by World climbing society. As confirmation of the fact I brought together nearly all links from English speaking web, I was able to find (see below). From other hand everyone who has luck to meet "Bal" (that was his nickname) know for sure - he was outstanding climber and great personality. 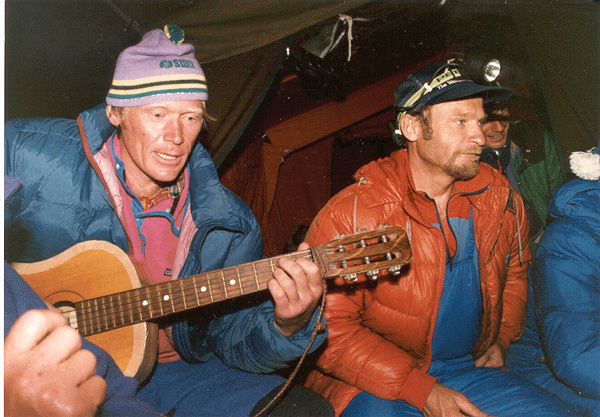 At 6 am on May 4 V. Balyberdin and his climbing mate - Edward Myslovsky (45 years, MS - 1966, MSMK - 1968) came to the summit and at 14:30 Balyberdin first in the USSR reached the summit of Mount Everest and asked by the radio: "All the way going down ... what should I do next?" 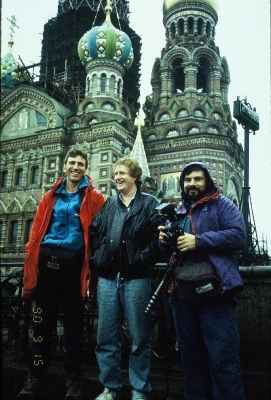 For this ascent Balyberdin was awarded the Order of Lenin "(05/07/1982). According to a survey of sports journalists of the ten best athletes of the Soviet Union in 1982 for the first time in the history of Soviet sport was named Mountaineer - Vladimir Balyberdin. First ascent - 05.05.1969 at alpiniade SWD "Petrel" (in section LEIS, coach Rapoport Fiver Abramovich). 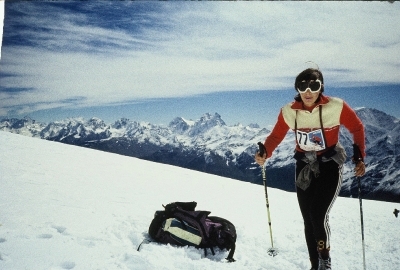 1977 - won first place in mountaineering biathlon (cross-country skiing and slalom). These competitions were held for the last time - he had ...! 1988 - Section Lenin on W gr., 5a, hands. 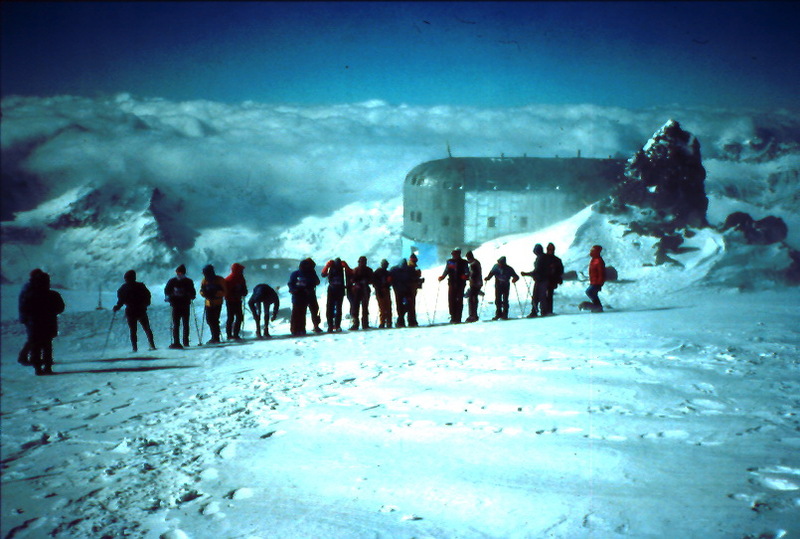 1990 - n. Victory to 7050 m (with slope - on Letavetu (on Abalakov!-Hill specify) hands. 1978 - Zamin Karor on W sf. W art. (Lavrukhina), 5b, Cherevko + 3, peak Communism in the ribs, 5b, Afanasiev + 3. 1979 - peak. Revolution, 6 c / tr., Chunovkina G. + 7. 1980 - peak Korjenevskaya by South ridge, 5a; traverse n. Communism from peak "6950", 5b. 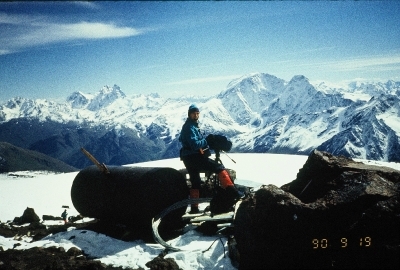 1982 - Everest SW Wall, pp. 1984 - Revolution item in the center of SW art., 5b, PP, V. Balyberdin + 4., N. Revolution of SW Art. (By Nekrasov), 6, Razumov Yu + 3, n. newspaper "Komsomolets in Kyrgyzstan" by the CA walls, 5b, PP, Balyberdin + 3. 1985 - The Marquee (Tien Shan), NW Art. 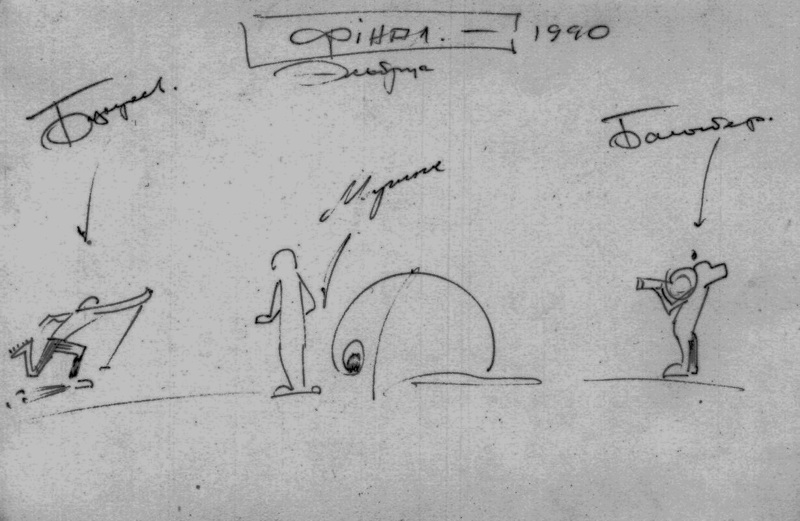 Pp, 6, Balyberdin + 5; tent in the center of NW Wall, 6, pp, Balyberdin V. + 7; Clause "5290" (usch. Havrez Dora) on NE Buttress, 5b, in the deuce with Shustrova N.; cold wall in the center of the art., 6, pp, Balyberdin + 7 (2 place in the championship of the USSR). 1986 - Zamin Karor SW by W sf art. 5b, Razumov Yu + 3; Zamin Karor 1-I Zap. NW Art., 6, Razumov Yu + 3, n. Engels center in Art., 6, Balyberdin + 5; forth Engels wells Yu Art., 6, pp, Balyberdin + 7. 1987 - The Lenin on W ridge., 5a, winter ., peak Communism by north ridge., 5b; Khan Tengri in the center of east face., 6, pp, Shustrov N. + 5; Khan-Tengri on W ridge - speed ascent in 1 day., 5b, peak Pobedy (Victory) W ridge, 5b, Balyberdin + 4. 1988 - Lenin forth through the rocks Lipkin, 5a, , peak Pobedy (Victory) from Chon-Teren pass, 5b; Traverse: n. Victory - peak Military Topographs, 6b,. 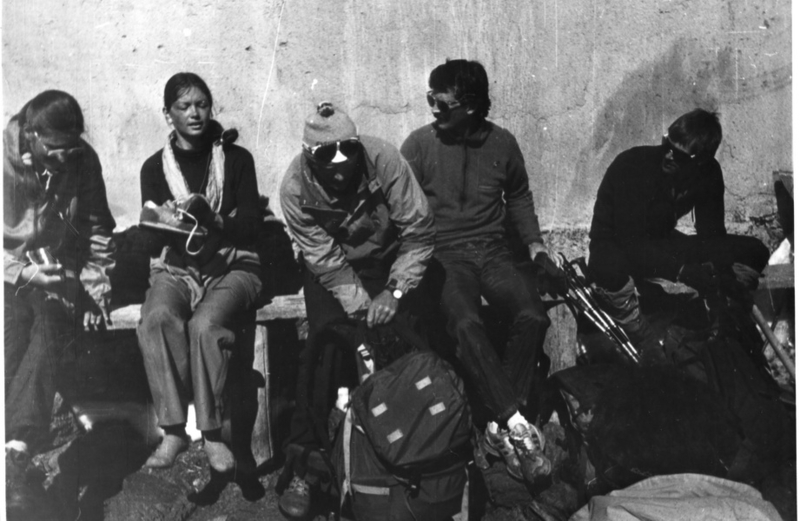 1989 - 2-nd Soviet Himalaya Expedition: April 15 - in the group B. Hrischatogo up (like the whole group - without oxygen) by the average peak of Kanchenjunga (8478 m.), pp. Then - May 1-2 in group B. Elagina passed successively South (8491 m), medium (8478 m), Home (8586 m) and West (8505 m) peaks, pp. Over the ascent was awarded the Order of Friendship of Peoples ". 1990 - Winter: n. Victory (by Letavetu) Balyberdin + 3, n. Eug. Korjenevskaya by south ridge from the glacier Moskvina, 5b, Balyberdin + 5; Peak Communism with the slope of the glacier, and Walter B. Barrier, 5a, Balyberdin + 5. 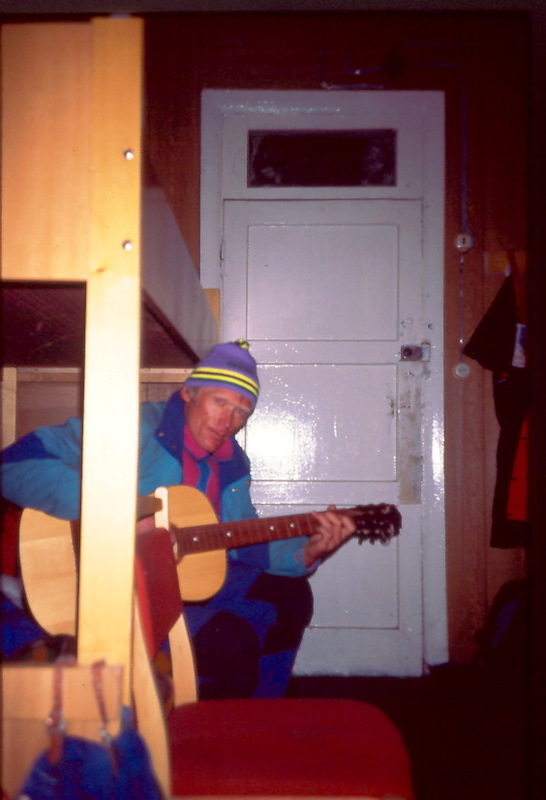 1991 - October 7: Everest via South Saddle (without oxygen) - was the leader of the expedition of the St. Petersburg (own) cooperative "Mountaineer". 1992 - Chogori (K-2 on the edge Abrutskogo) hands. Russian-American expedition. Ascent is committed by a group consisting of: Balyberdin, Nikiforov, Kopeika G. As a result Balyberdin became the first climber in the USSR, inherited the three highest peaks in the world. Vladimir Balyberdin, age 45, the most famous Russian mountaineer of his generation, was killed in a traffic accident in St. Petersburg last summer. His sad death highlights the massive changes which have taken place since the collapse of Communist Russia. On the night of July 22, 1994, Balyberdin, who made the first Russian ascents of Everest, K2, and Kangchenjunga, died when his car (awarded to him as a “perk” for being a successful mountaineer) was caught under the wheels of a lorry. He had been using it as an unofficial taxi to earn extra money in Russia’s struggling free market economy. Balyberdin is survived by his wife and three daughters. 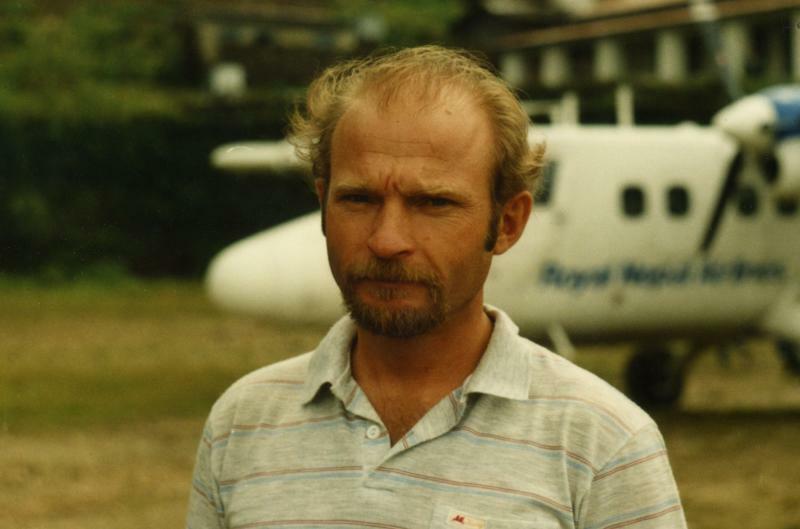 In 1981, at age 32, Balyberdin became the most famous Russian mountaineer when he made a daring first ascent of the West Face of Everest, which has never been repeated. 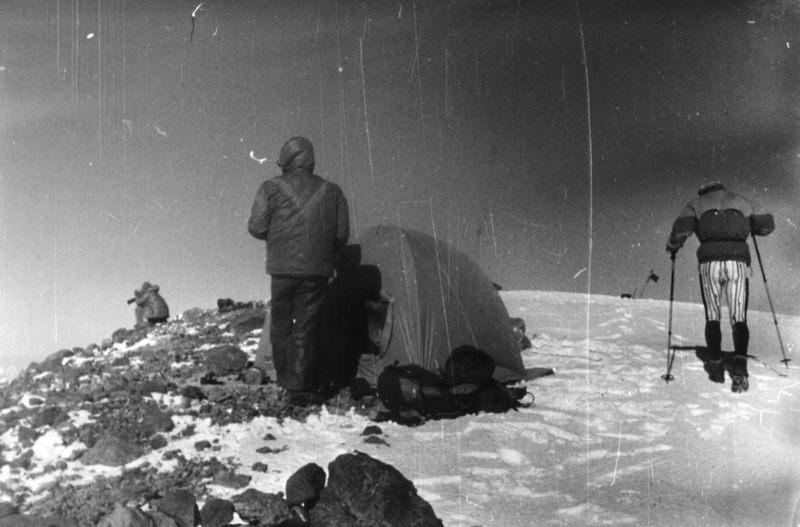 Soviet team members climbed in the standard Russian style of the time, using thousands of meters of fixed line and oxygen, wearing cotton clothing, and sleeping in old-fashioned cotton tents. In 1991 he climbed it again, without oxygen in three days from Base Camp, after only two weeks of acclimatization. This was disappointing for him, as he was trying to set a new speed record for reaching the summit of Everest, in order to beat the one set by Marc Batard in 1990: 23 hours. However, a week later on a second try to be “the world’s fastest man,” Balyberdin did manage to climb to 8200 meters in 20 hours with no crampons (they had been brought down to Base Camp a few days earlier without his knowledge). 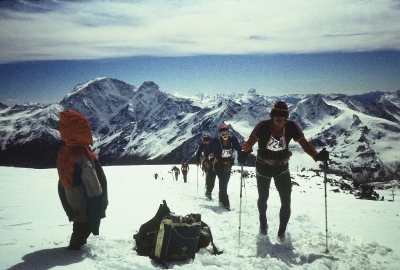 Balyberdin climbed Nepal’s 8586-meter-high Kangchenjunga (the world’s third highest peak) in 1989, with the strongest Russian team ever assembled. They completed a high traverse of the summit, spending a record five continuous days above 8000 meters, a feat which is unique even now. 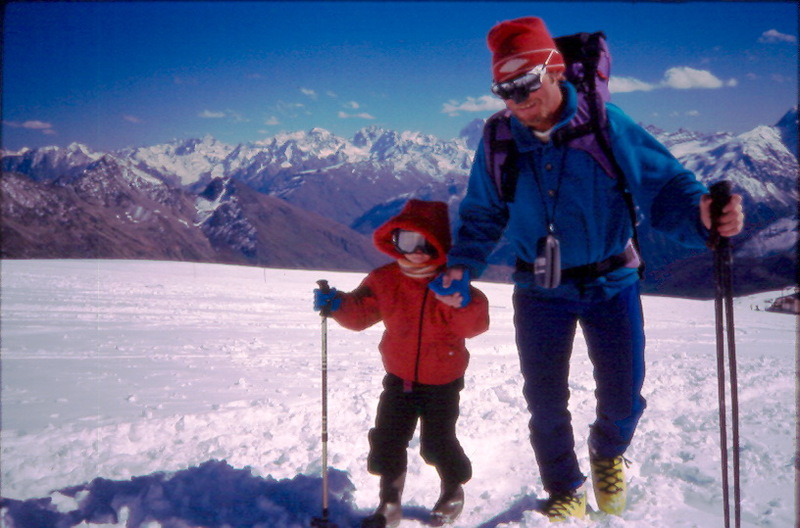 In 1992, when Balyberdin made his ascent of K2 (the second highest mountain in the world) it was under different circumstances. With President Gorbachev’s dismantling of communism in favor of the free market, government expedition funding had dried up, and Balyberdin was forced to enter the complex world of international mountaineering. The expedition proved to be a fantastic success with seven team members reaching the top. What qualities put Vladimir on top of the world three times on extremely difficult routes? I can say what they were not. Balyberdin was neither suave, charismatic, nor friendly. Behind his mild demeanor lurked a suspicious and selfish man. On several occasions, I watched him try to declare the expedition finished after he had summitted, unwilling to share the glory of success with anyone else. At other times, he made detailed plans to work with others, then changed his mind at the last moment, deciding to go “solo.” Inside this quiet and thoughtful-looking climber brewed a mysterious potion indeed, and you never felt like you totally knew the man. Balyberdin may not have been easy to be around, but he was an outstanding mountaineer. He came from a simple peasant upbringing in Tomsk, Siberia, and from years of Soviet mountain climbing competition with the Spartak sports club. 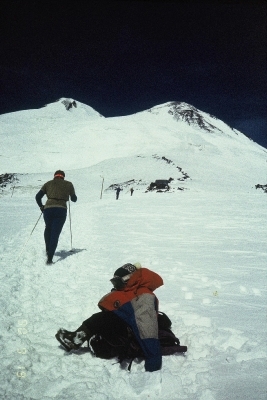 In his day, the only people allowed onto Soviet expeditions were winners of speed climbs held on the ice faces of 7000-meter peaks in the Pamirs, such as Pik Lenin and Pik Communism. Vladimir knew how to find a route better than nearly anyone. In 1991, in Everest’s Khumbu icefall, he led our group to fix 1,000 meters of rope on a new route in extremely dangerous conditions in only seven hours of climbing! His invulnerability to cold and altitude were legendary. In 1993 on K2 he was the only climber who would brave howling blizzards, while the rest of us waited in the tent, wondering what kept him going. Now we must say good-bye to Vladimir Balyberdin, this small, quiet, and complicated man. Like the great nation from which he sprang, he was a man of vast contrasts. Never ready to fully commit himself to teammates, he nonetheless commanded a rough-hewn respect from all of us, who stood awestruck at the raw power and intense focus of his effort. Dosvydanya Vladimir!"